Big Bend was to be the last major stop on this leg of the adventure. We have another round of travel planned before we hunker down and see if we can get back to some sort of normal life. However, initially, we weren’t going to rush back to Colorado. It’s a long drive from the Mexican border, so at first we decided we’d take about three days to do it, making a stop at Carlsbad Caverns on the way. We still wanted to get back to town before Friday lunchtime, to avoid as much of the Memorial Day traffic as possible.We were excited about Carlsbad Caverns, especially since this is the first national park that seems to offer an easy option for people traveling with dogs. One of the park concessioners offers a low cost, climate-controlled, kennel for park visitors, so that they don’t have to worry about their dogs while visiting the park. This would have meant that Angie and I could actually look at stuff together in the caverns. The plan was that we’d drive from Big Bend to Carlsbad, see the caverns and spend the night, and then the next day drive on to southern Colorado, pausing for dinner in Santa Fe with my old friends Alissa and Kim. We broke camp fairly early on Wednesday morning. After the brutally hot day on Tuesday, we had gone to bed with the thermometer still reading in the 90s, but actually managed to sleep fairly well. When we got up around 6:30, it was still/already 75° out. Angie didn’t even want to light the stove to make coffee. We decided to see what we could find at the store up at Panther Junction, where we were also planning to buy overpriced gas, since it would be many miles until the next gas station. It was, again, 20 miles just to the gas station, but the store there did have things that we could/wanted to drink for breakfast. I was able to get a decent cup of coffee while Angie gassed up the car. 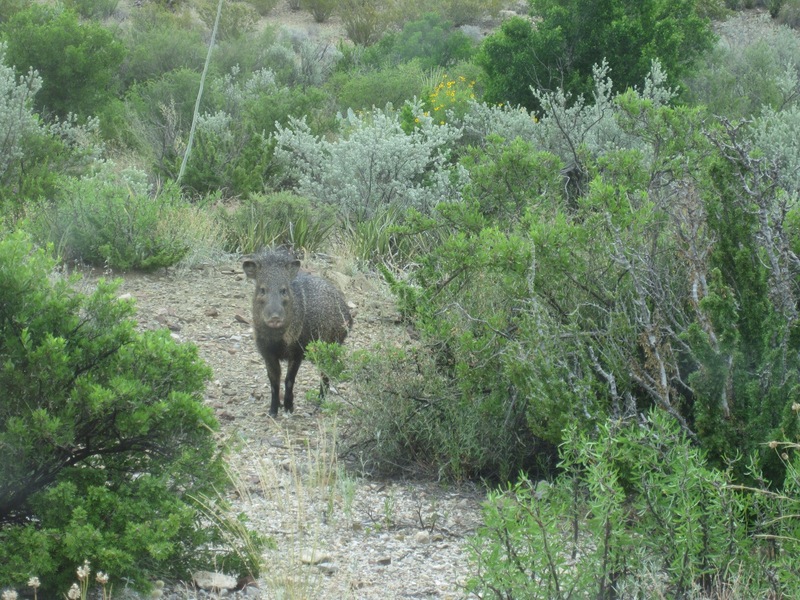 As we were driving toward the park exit, we had a sighting of one of the creatures about which we had been warned at the campsite, a javelina. In fact concern about the risk from these animals was so high that the camp management have put signs on the picnic benches at each site warning people to keep their food in the food safes. I was ok that we hadn’t seen one near our tent, but we were kind of thrilled that we saw one before we left the park. We stopped the car and I grabbed the camera. The beast seemed to stop and look at us, and consider coming closer, but as I took some pictures it took off. We left the park (another 20 miles or so) and were rolling along, with me driving, when Angie got a call telling her that one of her family members, along with our older dog Shiloh, were both under the weather. We didn’t hesitate before deciding to change our plans once again and just head straight for home. It would still take us two days, but we decided that we should skip Carlsbad, and sadly, even dinner with my friends, in order to get home faster. We hadn’t booked any accommodations for the upcoming night anyway, and we’ve becoming so used to switching gears, so to speak, that changing plans was not a great effort. While I drove, Angie worked on figuring out our new strategy. We drove a bit longer in the day than we might like to and stopped for the night in Las Vegas, N.M. at a Super8. We settled on this location for the night because it would be a shortish drive for the last leg back to Lakewood. We hadn’t stayed in a Super8 previously, but this was a quite impressive establishment. They offered a couple of types of soup that accompanied our leftovers for dinner. It was the first hotel we’ve experienced that offered free food for dinner, but these folks seemed to be very focused on being as hospitable as they could. The hotel also offered a fairly extensive breakfast, including poached eggs. They even had a patio where we could have Rebbe with us while we ate our breakfast. After we had eaten, we headed off, and made it back to Angie’s brother’s house by mid-afternoon. We’re going to stay here for a few weeks and take care of some household and personal matters before heading back to Ohio for Angie’s parents 50th wedding anniversary celebration. We don’t have a home of our own to be in while we’re here, but Greg very graciously lets us stay and take over the kitchen while we’re here, so it’s pretty close to home. Who would’ve thought you’d have such a great experience at Super8. I’ll have to give them another try. Good that you were able to switch gears – hope everyone is doing better now. Stay cool! Sorry you missed the bats.